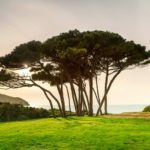 Can Amoryn Boost Mood, Cognitive Function And Restore Your Zest For Life? Many of us lack motivation and drive, but when life gets on top of us we can feel depressed, tired, irritable and lack the mental clarity to think straight. Amoryn Mood Booster is a nootropic supplement that is designed to naturally increase levels of the “feel-good” hormones that the brain needs to stay content, more focused and productive and ultimately feel more positive and self-assured. How Does Amoryn Mood Booster Work? Amoryn helps to increase the natural levels of the 3 main feel good hormones; serotonin, dopamine and norepinephrine in the brain to regulate mood and maintain a more normal emotional balance so you can enjoy life again. It works very steadily over a period of a few weeks, after 6-8 weeks, the full benefits of Amoryn can be felt. 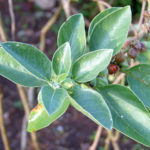 Hyperforin is the active ingredient in St. John’s Wort and it is known as a reuptake inhibitor. 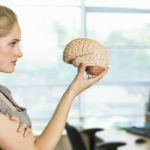 A reputake inhibitor increases the levels of the brain’s “feel-good” chemical messengers that include serotonin, dopamine and norepinephrine to help boost mood, reduce negative thoughts and restore emotional equilibrium. 5-HTP is a natural amino acid that is extracted from the Griffonia simplicifolia plant. The body converts 5-HTP into the neurotransmitter serotonin. Serotonin controls a lot of our cognitive functions including sleep, mood and anxiety, by increasing our levels of this chemical, emotional balance is restored. Rhodiola rosea is a herb known as an adaptogenic, this means that it helps to increase serotonin activity in the brain. 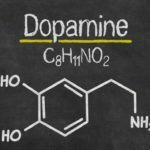 Its believed to increase the activity of the dopamine and norepinephrine neurotransmitters by inhibiting the activity of the enzyme COMT that hinders the performance of both dopamine and norepinephrine. 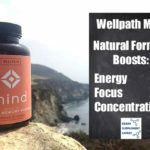 Clinical trials have shown how Rhodiola rosea can help to reduce feelings of anxiety, boost the feeling of confidence and well-being, reduce lethargy and improve memory and learning. The Amoryn formula is supported by essential vitamins and minerals that include Zinc, Selenium, Vitamin D3 and Vitamin B. The manufacturers recommend that users begin with 2 capsules a day, ideally, one in the morning and another in the afternoon. 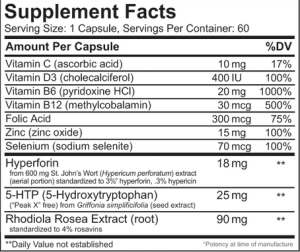 Depending on how you respond, the dose can be gradually increased to 3 to 4 capsules daily. Those who are slightly built; i.e. weigh less than 120 pounds, those who are sensitive to medications or suffer from insomnia should start with just one capsule a day. Children between the ages of 12 and 18 should start with one capsule a day and after 2 weeks can be increased to 2 a day but no more should be taken unless told to do so by a doctor. Amoryn is not suitable for children under 12. Amoryn does not appear to have any serious side effects although photosensitivity has been reported in some users, particuarly fair skinned individuals because Hyperforin can increase sensivity to sunight which is why it is important to wear sunblock while using Amoryn. 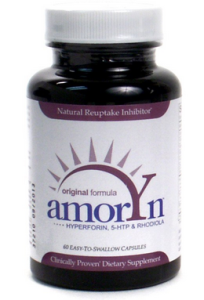 Amoryn is not suitable for anyone suffering from a serious mental health disorder such as mania, schizophrenia, or bipolar disorder due to its mood elevating effects. Epileptics should not take Amoryn without seeking a doctor’s advice and it is not suitable for pregnant or breast-feeding women. Those taking SSRI’s (Selective Serotonin Reuptake Inhibitors), betablockers, anti-coagulants, triptans, the contraceptive pill and chemotherapy amongst other medications should not take Amoryn. Amoryn is an all natural formulation, the manufacturers disclose full ingredient information which is reassuring and gives the customer confidence when purchasing. 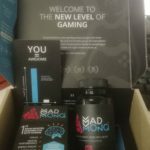 Many of the ingredients are clinically proven to have positive effects on congitive function and mood. However, Amoryn does interact with a large number of medications which is concerning and could mean that many individuals may be unable to take Amoryn safely. Reviews and testimonials are generally positive with many saying that once Amoryn kicked in that their anxiety subsided and improved their overall outlook on life making them more productive, more focused and more motivated. However, there are those who felt that Amoryn did not work for them whatsoever. 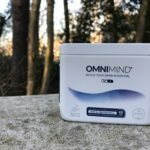 Its recommended on many independent sites as a possible solution to those with mild anxiety and depressive episodes, although it isn’t a miracle cure and as it isn’t actually medically approved, I personally wonder how much of it is a placebo effect and how much of it is really having a beneficial effect? Amoryn is available worldwide from the manufacturers website. Prices begin at $34.95 for a 30 day supply. The manufacturers offer a 60 day money back guarantee and free shipping for those in the US. All in all, an inexpensive and quite simply formulated product. There are however alternative products out there with (I have to say) more advanced and in depth formulas that offer better results right across the board. Quite frankly it’s rather worrying and ultimately stops me from recommending Amoryn as a viable supplement… Quite frankly there are (in my opinion) better products out there…. 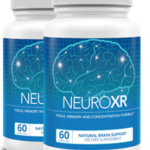 Click below to discover my top rated nootropic supplements.